It is hard to imagine the number of people who have died since the beginning of time. At present, there are a little over six billion people living on planet earth. With each century, millions of lives are lost to an endless parade to the grave. Wars, famine, disease, and natural causes all lend themselves to the constant flow of death. In a twist of observations, the wise man suggests that while the grave seems never to be full – so the desires of man are never enough. There has never been a time when men could truly say that all they ever desired or wanted was complete. The horizon always has a tantalizing appeal of seeking what is beyond. Oceans have been traversed seeking new lands, continents have given up age-old secrets and the heavens above are plumbed for every ounce of information. In the long quest of man seeking greater heights, he finds at the end of his journey an empty expanse calling him to look for more. There never is enough. For the most part, the pursuit of the unknown has driven man to find more about the world he inhabits. Science has expounded the knowledge of the beautiful world created by the hand of God. Seeking answers is embedded in the need of man to know everything he can. Sadly, this same desire has destroyed man. The appetite of the flesh is insatiable. Failing to see the nature of sin as only a temporary pleasure, man pursues more and more of what he desires filling a bottomless cup with what he believes is enough. Working a lifetime to have enough money to be happy is like trying to fill the vast caverns of death with all the people who have died. It cannot be done. The lesson of the wise man is to realize the failed theology of getting enough is impossible. Having enough will always be a little more than we have. Pleasure will always drive the hungering passion for more. 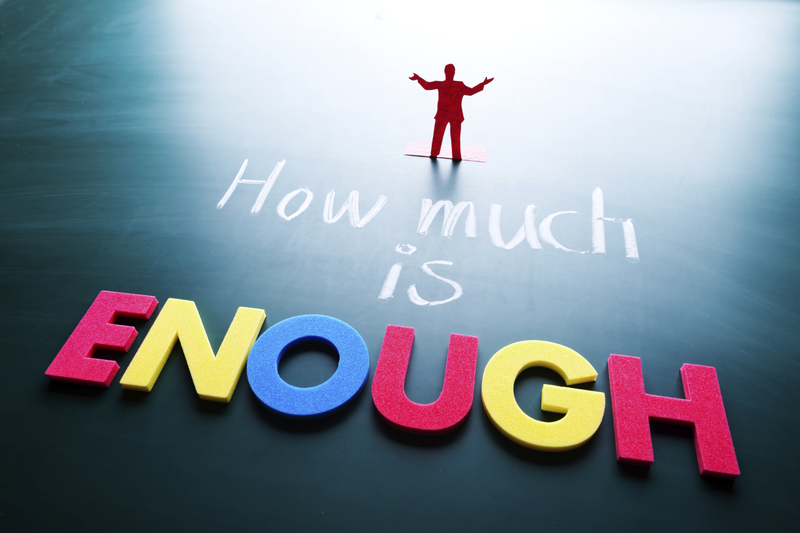 The word ‘enough’ is a funny word because so often it never means what it says. “If only I can have enough of this or that I will be happy,” the reckless proclaim. The eyes of man are never full. They will always be looking for something more, something else, and something new, and something more exciting, and something … sufficient? Never happens. A lifetime can never make possible the filling of the desires of the flesh. Yet the aim of most people is to gain enough. Jesus came to give us all we need. There is a way to have everything we seek in life and enjoy the blessing of unending happiness. It is found in a relationship with the Son of God. Jesus came to give peace and hope to the desperate hearts of men seeking the elusive dreams of enough. In Christ, we can be full yet never satisfied. A lifetime can never complete the full picture of who God is and the love of His Son. The greatest joy is to know that a day will come when we can truly say, “enough is enough.” Death will be enough because beyond the shadow of the grave is all we need. What a joy that will be to have enough in the presence of our Father.